Prettyisprettydoes is dedicated to all things that make you look and feel pretty. Beauty is in the eye of the beholder...and those of us holding the mascara wand. After two decades of covering the beauty industry, I've come to learn what makes it so alluring. Finding the perfect shade of makeup to match your skin tone, adding a swipe of eyeliner to give your tired eyes a lift, discovering an innovative new product line, or indulging in a totally luxurious spa treatment. My experiences have been documented in magazines, newspapers and websites worldwide. I've tested newly formulated products in the lab, explored hair removal options, shopped for lipstick, added shine to my hair and succumbed to massage marathons--all in the name of beauty. I've written press releases, hosted makeover events and co-authored a Do-It-Yourself Beauty book (Alloy). On this blog, I write about products and services that I come across every day as well as those that have been provided by publicists or the companies that make them. Either way, I write what I think. I hope to share some of my insights--and bring you the latest, greatest beauty news right here. Join me in the quest to find all things pretty. It doesn't take much to look good this spring. But you do need a good line of basic makeup products to start with. Lavera delivers with good-for-you ingredients like organic oils and flower extracts for a natural makeup look and feel this season. The European beauty brand trades in harmful synthetics like parabens, emulsifiers, petroleum, phthalates, lead, synthetic preservatives and fragrances for natural, effective plant-based alternatives that arecertified organic whenever possible. Every cruelty-free, biodegradable product represents a smart, gentle choice for the skin, body and earth. Luxe Lashes: Whether you're at an indoor business meeting or an outdoor happy hour, you need this mascara. 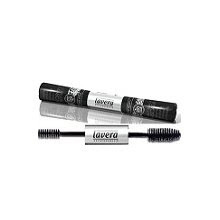 Lavera's Double Black Mascara ($20), made with organic beeswax and oil, includes a precision brush on one end to lengthen, strengthen and separate for ultimate impact, and a volume brush on the other end to create a breathtakingly full fan of lashes and holds lashes in place. Lip Shtick: Give lips a lift with this formula that's sure to dazzle. Lavera's Glossy Lips ($15), formulated with carefully selected, high-quality olive and jojoba oils as well as a soothing, pampering vitamins and minerals, is a must-have accessory. After just one swipe across each lips, you'll see a soft, healthy pout and a touch of seductive shimmer that really sparkles day or night. Available Shades: Shining Star, Rosy Promise, Magic Red, Almond Kiss. Skin Is In: Illuminate your skin with this super-smooth, all-natural foundation. Lavera's Natural Liquid Foundation ($20) is a hydrating foundation that blends easily and hides imperfections. Free-radical fighting argan oil, organic blossom butter and vitamins A, C and E protect, rejuvenate and nourish skin. Available Shades: Porcelain, Ivory, Honey, Almond. For more info or to purchase products, go to www.lavera.com. Mom of Harrison (age 3) and Ava (age 2), married to Jacques Brooks, and long-time freelance writer. On this blog, I write about products and services that I come across every day as well as those that have been provided by publicists or the companies that make them. Either way, I write what I think. Enjoy!